Daniel Suarez is an author I’ve come across a few years ago while searching for a good techno-thriller novel. Several readers warmly recommended his Daemon series, which I picked up on Kindle right away. And let’s just say, the rest is history. Here are the Daniel Suarez books in order so far. The list will be updated when the author writes new books. Born in 1964 in Somerville, New Jersey, Daniel Suarez (website) is a former IT consultant to several Fortune 1000 companies. As a child, he loved reading books, especially sci-fi and fantasy novels, and he also loved writing his own little stories. He continued his love of writing throughoug highschool, and when he went to university, he knew he wanted eventually to become a writer. Daniel attended the University of Delaware from where he majored in English literature. In the 1980s he moved to Los Angeles where he met his wife, Michelle. This is also where he got interested in the business of writing software code for businesses. He has worked for 18 years as a systems analyst in technology. During his work there he has created mission-critical software pieces for the defense, finance and the entertainment industry. He was always interested in IT work, and his novels translate his love for technology effectively and effortlessly. The author is a man who knows what he is writing about. Daemon came to the author’s mind back in the 1990s when he was writing a program called Weather Master, which had the job of tracking weather patterns for worlds of fiction. He offered a 30-day trial to the users who eventually bought the program. Daniel just about forgot about the money, and when he remembered to check his account, he realized just how strange the whole online automation is. You could even die and the money would just grow and grow from all the sales you do. The author first started writing his debut novel in 2002, and it took him two years to finish it. Next, he tried several publishers for his book, however, one of the biggest objections coming from the publishing houses was that the book is too long and too technical for a debut novel and would not be interesting for the general readership. So, when he got rejection after rejection for his book, Daniel Suarez decided to self-publish his story because it was one he really wanted to tell the world. He went with Lightning Source, a US-based print-on-demand service which also helps books reach Amazon. With this out of the way, all the author needed to do was focus on marketing and promotion, which he started by word-of-mouth on the internet. This was one year before Kindle happened, so it was more difficult than now, when publishing directly through Amazon is done routinely by authors. Eventually, Daniel Suarez was approached by Dutton, which republished the novel Daemon in 2009. Dutton also picked up the sequel, Freedom (TM) and published it in 2010. 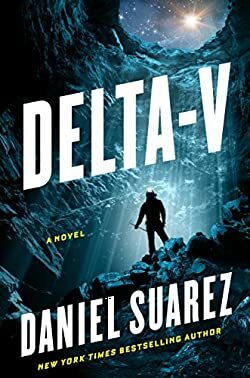 Ever since then, Dutton has been the publisher of all upcoming Daniel Suarez books, including Delta-v, released in 2019. He released a short portion of it freely, and, once it got traction through everyone loving what they’ve read, the book was mentioned in Wired magazine, which propelled the book to a bestselling status in the US. Each of his books touches on cutting edge technology with some science – and fiction – mixed in for a blast of a suspenseful read. While you’re reading Daemon, his explosive debut novel, you can’t help but wonder whether we are on the right track with making fast strides with further technological advancements and whether being stuck in the caveman era would have maybe been a better choice. But then again, while reading his next novels, you realize that technology is not the issue here – it is what it is. The people are those who use it for the greater good, or to their own advantage, and a new feeling creeps up from the depth of your soul, from a place you didn’t even know exists: the evil shown in the books is real. The monsters are indeed among us, and if we let them keep control of the society we so hard fought to create and develop, we will end up in a future dystopia. And I’m not sure if there will be a Katniss Everdeen to save us all along the way. Knowledge is power, but used the wrong way is an even more powerful weapon of mass destruction. For his books, Daniel Suarez does a lot of heavy internet research, and, depending on the book he is writing, he might also travel to the locations presented in the stories for more authenticity. Also, he likes to speak with experts in their fields. For example, for Kill Decision, he interviewed robotics experts and special forces operatives, while he also read several books on robotics and the related sciences. He usually spends 3 months doing the research, followed by 3-4 months of structuring his story and fleshing out the characters, and then the rest writing the novel itself. Daniel Suarez has only written 6 books to date, but each of them is a best seller in its own right. The fans of techno-thrillers are eagerly awaiting the next book with strong anticipation. The author has a strong readership and people on various forums, including Facebook groups and Reddit usergroups, are some of his most oval followers. In Delta-v, James Tighe, a cave diver, is asked by billionaire Nathan Joyce to join him on his private island. Initially, James thinks he was not the intended recipient, however, eventually he goes and get engangled into a strange competition for mining an asteroid that could help the billionaire start an off-world economy. The competition is fierce, yet, they all must rely on each other to survive in those harsh conditions in space.